Why We Need Commercial Paper Shredders? How do you destroy confidential documents in our office? There is no method better method than using a paper shredder. Commercial paper shredders are designed for companies that handle large documents. These documents are usually confidential. Heavy-duty commercial shredders may come with a few extra features to make shredding easier. 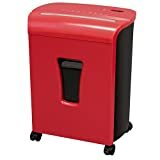 and (3): Best commercial paper shredders under 200$. Fellowes is one of the best if not the top shredding companies. The brand has made a new for itself by building standard products. This product works efficiently and stands the test of time. The Fellowes PowerShred 99CI is a masterpiece. The shredder is portable and features a cross cut design. The Fellowes PowerShred 99Ci uses a crosscut blade, this makes it safer to use. Crosscut blades shred papers into tiny rectangular shapes which are hard to put back together. These products put safety as a priority, it features a safe sense of technology. This technology stops shredding when it senses human hand on the paper opening. This feature is important, as it helps to reduce injury that may occur while shredding. You don’t have to worry about packing up the shredded papers. It comes with 9-gallon bin, which can contain a huge load of shreds. Another highlight of this product is the Jam proof system. This shredder comes with a patented Jam proof technology, which uses three levels of advanced protection. This product can also be used to shred discs, credit cards, staples, and paper clips. Fellowes is one of the best if not the top shredding companies. The brand has made a new for itself by building standard products. This product works efficiently and stands the test of time. 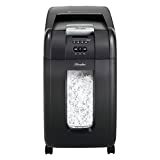 This is another product from Fellowes, the Fellowes PowerShred 425CI. It is another variant of the PowerShred CI class, this product is portable and also features a cross-cut shredder design. The auto-oil technology feeds the blade with oil when it senses they are short on oil. The Jam prevention system, on the other hand, uses three levels of protection to prevent Jam. This shredder also comes with an energy saving system. This system helps to optimize energy usage and efficiency during runtime. Swingline is another top brand in the shredding world. They manufacture high power shredding machines which can be used for large volume shredding. Swingline proves it is more technologically inclined with the introduction of the smart tech app on this product. The Swingline paper shredder is a fully automatic paper shredding beast. All you have to do is feed the papers into the auto feed chamber. There are rollers embedded in this shredder, they automatically feed the papers to the cutters. This feature saves you the time of standing by the shredder to supervise it or arrange papers. The Swingline paper shredder also features self-cleaning cutters. This feature automatically removes shreds that are caught up in the cutters to prevent Jam. This machine helps you save energy by automatically turning off when idle and resuming when it senses paper is inserted. This shredder shreds in the secure cross-cut format, and also comes with a P-4 security level. You can set a secret four-digit pin to enter whenever you want to access it. The Jam related measures on this shredder are superb. It automatically reverses stuck papers and tries to feed it back into the shredder. The Bonsaii EverShred Pro 5S230 pro is a powerful machine, with over 4 hours continuous running time. It features a micro cut shredding format and can shred five sheets of paper at once. The Jam protection on this shredder is impressive. It features the auto-start and auto-reverse to protect users for paper jam, overloading and overheating. The EverShred Pro 5S230 is a product from Bonsaii, one of the shredding powerhouses. The EverShred pro prides itself on continuous shredding and quiet operation. It weighs a meager 38.6 pounds and is highly portable. This machine can also shred other materials, not only papers. It can easily shred discs, credit cards, staples, and clips. The noise level on this shredder is low, this product prides itself on the low noise level it has managed to achieve. It comes with a 7.9-gallon bin to take care of your disposal needs. It comes with a P-6 security which allows the shredder to make shred papers into tiny bits of 1/26 * 5/21 inches. You don’t have to worry about the safety of the shredded papers as this size is impossible to assemble. GoECOlife is a machine making brand which specializes in paper shredders. The GXC205Pi is a product of GoECOlife, a commercial paper shredder. This paper is highly portable and can be fitted under the desk. This shredder features a power saving feature. This feature automatically turns off the machine when it’s not working. It does the opposite when a paper is placed on the sheet tray. The GoEcolife GXC205Pi Platinum Shredder is a portable commercial paper shredder. This paper shredder allows users to shred sheets easily by using a horizontal front feeding. This machine has the capacity to shred continuously for twenty minutes. Like most commercial shredders, the GXC205Pi Platinum can also shred different materials like credit cards, staple, and discs. 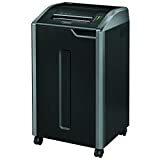 This is a paper shredder backed by AmazonBasics, it features a cross cut format of shredding. It is cheap, works very fast and efficiently. This product promises safety by shredding papers into unidentifiable pieces. 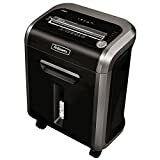 AmazonBasics 6-sheet cross cut shredder can shred up to six papers simultaneously. This paper shredder can make up an essential acquisition. It helps you to get rid of confidential or sensitive documents easily. This shredder is cheap yet it performs up to expectation. This shredder is perfect for light use in small offices and businesses. This machine can also be purchased for personal use at home. The AmazoBasics 6-Sheet Cross Cut shredder also works in auto mode. When set to this mode, the sensor begins work as soon as its sensor senses paper placed on them. This machine can shred continuously for two minutes then take a 30 minutes rest. It tidies up the work by dropping the shreds into a 3.8-gallon bin. 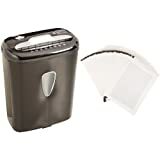 The AmazonBasics 12-Sheet High-Security paper shredder is another recommendation from Amazon. It offers high power operation and efficiency. This paper shredder features a micro cut format of cutting. It is portable and very efficient in destroying confidential documents. It can shred paper into tiny bits of 5/32*15/32. This shredder also incorporates the autostart technology common to paper shredders. This technology uses sensors to detect paper and start working or stay idle (or power off) if it detects none. It also comes with an automatic reverse technology. This helps to reduce and clear paper jams while working. It has thermal prevention to prevent over-heating. This shredder can work continuously for eight minutes without stopping. It neatly dumps the paper shreds into a 6.7-gallon bin for easy disposal. The micro cut format adopted makes it a high-security shredder. This shredder from Amazon basics is perfect for small-scale uses. With portability and flexibility in mind, this shredder can shred through products easily. It efficiently cut through sensitive documents in the crosscut format rendering the document unreadable. This can go a long way in protecting you from Identity theft in the case of bills, invoices and other sensitive documents. Although it has to shred one at a time in the case of credit card, this is due to varying materials and thickness when compared to paper. This product is relatively cheap and is easy to maintain. It dumps the shreds in a 4.1-gallon bin incorporated into the body. This machine has a LED indicator which indicates imminent overheating. This product also features an auto mode which takes care of shredding and power on or off. It features the manual reverse which helps to automatically clear paper jams. This shredder will need 30 minutes to cool down after 3 minutes of continuous run time. It is important to note that, this shredder shreds six times smaller than the normal cross cut size. This is another product from Amazon, it features a high-security micro cut shredder. It can shred up to 6 sheets of paper simultaneously. It comes with 24 packs of lubricant sheets. These sheets help to sharpen, clean and lubricate the blades. These lubricant sheets also help to prevent paper jams, reduce static dust and for more efficiency. The sheets are a major highlight of this product. They can be used to sharpen the blades, clean the blades and lubricate the blades. This shredder from AmazonBasics is good for small-scale uses. With portability and flexibility in mind, this shredder can shred through papers easily. It can efficiently cut through sensitive documents in the crosscut format rendering the document unreadable. This can go a long way in protecting you from Identity theft in the case of bills, invoices and other sensitive documents. Although it has to shred one at a time in the case of credit card, this is due to varying materials and thickness when compared to paper. It also comes with an automatic reverse technology. This helps to reduce and clear paper jams while working. This product is relatively cheap and is easy to maintain. It dumps the paper shreds in a large capacity bin incorporated into the body. This machine is cheap. These shredders feature the latest technologies utilized in shredders. Now you can say goodbye to the problems of paper jams. Its energy-saving design makes it favorite among shredders. Just a simple touch of the hand and the shredder will go off. Thanks to the SafeSense technology design in this shredder. The Fellowes PowerShred 99CI uses a crosscut blade, this makes it safer to use. Crosscut blades shred papers into tiny rectangular shapes which are hard to put back together. This product puts safety as a priority, it features a safe sense of technology. This technology stops shredding when it senses human hand on the paper opening. This feature is important, as it helps to reduce injury that may occur while shredding. 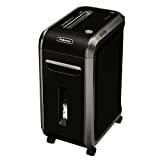 This shredder is a heavy duty machine, it comes in a black color. It has the capacity to shred up to 18 sheets of paper in a single feed. It shreds in the crosscut format and can also shred items like credits cards, discs and staples. You don’t have to worry about removing staples from the papers, the shredder shreds perfectly. It operates quietly, you don’t have to endure the annoying noises most shredders make. The Bonsaii EverShred C149-C can run continuously for an hour, shredding your papers to tiny bits. It comes with four casters and brakes for portability and easy mobility. It comes with a cooling system which helps to prevent overheating and save more running time. Also, it comes with a jam prevention system which automatically detects jams and reverses it. 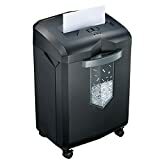 This paper shredder features a cross cut format of cutting. It is portable and very efficient in destroying confidential documents. It can shred paper into tiny bits of 7/32*1-27/32. This shredder also incorporates the autostart technology common to paper shredders. This technology uses sensors to detect paper and start working or stay idle (or power off) if it detects none. It also comes with an automatic reverse technology. This helps to reduce and clear paper jams while working. It has thermal prevention to prevent over-heating. This shredder can work continuously for twenty-five minutes without stopping. Then it takes 60 minutes to cool down. It neatly dumps the paper shreds into a 7 gallon pull out bin for easy disposal. The crosscut format adopted makes it a high-security shredder. It features LED indicators which indicate standby, overheat, overload and door open. It uses smooth rolling wheels to make paper placement easy. Sentinel is one of the top brands when it comes to building strong and durable shredders. This item comes in blue, black and gunmetal colors. This shredder is built to function as a medium duty shredder. It also features the autostart or stops technology. This enables it to start working when its sensors detect paper on the tray and stop working as soon as there is none left. This technology saves you the stress of powering it on and off each time you need to shred. Unlike most shredders of its size and price, it comes with a manual reverse function. This function allows the user to manually reverse the cutting blades in case of a jam. It comes with a 4-gallon bin which helps the user to easily dispose of shreds. This shredder can work continuously for two minutes. It comes with casters which helps to move it around the house or offices. It can shred up to 10 sheets of papers simultaneously. The shredder can also shred credit cards, discs and other objects of similar material. Shredder is another variant of the Sentinel brand. This shredder can be seen as a heavy duty because of its operations. It comes with a manual reverse function. This function allows a user to manually reverse the cutting blades in case of a jam. It also comes with casters which help to move it around the house or offices. It comes with an auto start or stops technology. This enables it to start working when its sensors detect paper, discs or credit cards on the tray and stop working as soon as there is none left. It shreds materials in the micro cut format, ensuring high security and safety. This shredder can shred up to 12 sheets of paper at once. A 5 gallon pull out bin is attached to it for easy shreds disposal. People, offices, and businesses shred document for different reasons. Many confidential documents may be generated and used by different sections of a business or company. For example, the cashier that swipe credit cards and make a photocopy of the cards may need to shred them later. This is usually done to prevent identity fraud. The paper shredding method is a lot more efficient and less than the traditional tearing using hand or scissors. You can tear documents of about fifty pages using hand or scissors. Even if you try, it can’t be easy. Paper shredders proffer solution to this problem. They can shred documents of hundreds of pages at once before you even get to blink. It is widely agreed that paper shredders are important in increasing and maintaining productivity in businesses. The strip cut shredders: This type of shredder uses one blade. It cuts documents into tiny thin strips of up to a width of 1/16. This type of shredder also comes in different sizes, ranging from desktop shredders which handle single documents to more advanced industrial ones. Strip cut shredders can handle more work than the cross cut type. Crosscut shredders: In contrary to the strip cut shredders, the cross-cut shredders utilize two blades. Cross cut shredders offer more security when compared to the strip cut shredder because the pieces are hard to put back together. They shred documents into tiny rectangular pieces of a width of up to 3/8 inches * 31/8 inches. Industrial Shredders: Just as the name sounds, industrial shredders were invented for handling large shredding work. This type of shredders is only used by big companies. They can shred document of a volume of more than 400. This type of shredders don’t just shred, they can help you arrange the shredded papers for easy disposal. Cardboard Shredders: The cardboard shredders are mostly used for shredding thick papers cardboards. Paper or cardboard shredded by this machine can be used to pack materials meant for use. They are mostly used by warehouses and shipping related businesses. Commercial paper shredders have become popular due to the increasing need for information protection. Paper shredders can solve the problem of Identity theft and leak of company information. Regardless of your budget, your shredding machine must be able to serve the basic functions of a shredder. It must be able to shred papers and have a jam prevention or correction system. The shredder must be able to optimize power usage while exhibiting low noise level.